"I never did think that guy was crazy." 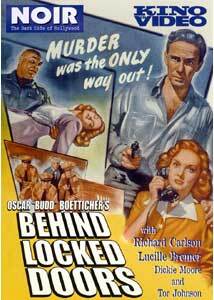 Behind Locked Doors is one of many, obscure, classics produced in thelate 40's/early 50's on shoestring budgets. In the same way that publishing housesmade small fortunes putting out 10-cent, pulp fiction books in the droves, Hollywoodstudios tried to do the exact same thing with movies. Many of these movies arepretty laughable today, with their melodramatic plots and cheap dialogue, but at thesame time they offer a look into a bygone age of filmmaking. Kino Video hasrecently been re-exposing these rare, virtually lost films in their "Noir" collection, andit certainly marks one of the most unique uses of DVD to restore and archivecinema history. In the film, private detective Ross Stewart (Richard Carlson) has just opened hisbusiness. His first client is the mysterious and alluring Kathy Lawrence (LucilleBremer). Ms. Lawrence reveals that she has reason to suspect that a corruptjudge, hiding from the law, might be holed up in a local sanitarium. She proposesthat, in return for splitting the reward money, Ross should commit himself to thesanitarium in order to discover if the criminal Judge Drake really is inside. Heaccepts the proposition for $5,000 of the reward money, and manages to gethimself admitted into the La Siesta Sanitarium. Once inside, however, he discoversa corrupt group of doctors and attendants running the place like an out of controlprison. As he attempts to uncover the secrets within the sanitarium, he soonrealizes the extreme danger he is in and how no one can really help him should heget into trouble. As he digs deeper, Stewart discovers how the corrupt attendantsuse a mentally unstable, violence-prone man (Tor Johnson) to add a presence of menace over thepatient's heads. Despite its age, the first thing that stands out here is the stylish direction by OscarBoetticher. Every scene is painted with wonderful black-and-white cinematographythat uses broad strokes of deep black to confine the action to certain areas,especially in the grim areas of the sanitarium. Many scenes have great compositionyou usually never see in these "dime-a-dozen" B-pictures. This is certainly stylishfilm-noir at its best. I got the feeling that had this film featured more high-profileactors, it might have be more highly regarded in history. Of course, if the productionwould have been able to afford such actors, I doubt the film would have the darkcharm it does now. Many familiar faces from a variety of B-movies pepper the film, but central actorRichard Carlson will be most memorable for his work, particluarly classic sci-fi such as It CameFrom Outer Space and The Creature From the Black Lagoon. TorJohnson makes a typically silent, almost monster-like appearance as "Champ." Ofcourse, Johnson's work in Ed Wood projects like Bride of the Monster andPlan 9 From Outer Space is the genesis of his "fame." Despitethe high level of craftmanship here, it seems obvious that the filmmakers exploitedthe presence of Tor Johnson as if he were a freak of some sort. For a pulp crimethriller, the laughable inclusion of Johnson as an insane boxer seems merely an attempt to addan aspect of cheap horror. Image Transfer Review: Kino has done an outstanding job with this film visually, as it is one of the finesttransfers of a film this age I've ever seen. Despite negative issues like grain andsome minor frame warping, there are no digital artifacts or pixelization. Black levelis deep and sharp, and the cinematography comes across wonderfully. Audio Transfer Review: The mono soundtrack is about what you'd expect in a 40's era film. All sounds anddialogue come across well, and the little bit of music has good clarity as well. Unfortunately, it sounds as if the source print may have had some problems. Severalportions of the film have extremely choppy, warbly dialogue. Considering the poorvault status of these movies, I suppose we're lucky this is the only thing wrong withit. The mastering pretty much did what it could with the original audio. Extras Review: The disc contains no extra features. While this is disappointing, I suppose it's to beexpected from such an obscure film. On the bright side, the disc's chapter selectionmenu, and all of the keepcase artwork is based on the original film poster,recreating that vivid, pulp artwork. The presentation is sound, and the only extra Ican think of being worthy to add would have been maybe a commentary by a filmhistorian. Like many films of this age, the promo shots (the photos used on theback cover and insert) are not actually scenes from the film. The film feels very much like a serial picture because of it's oddly short length (anhour). The length does make it move pretty fast, however, and adds a lot ofentertainment value to a genre that often contained long scenes that included artful dialogueor romantic interludes. If you appreciate these wonderful, campy thrillers, check outBehind Locked Doors. It might not be Bogey and Bacall, but it's still funanyway. Recommended.